Copyright © 2004 by Thieme Medical Publishers, Inc., 333 Seventh Avenue, New York, NY 10001 USA. Growth hormone (GH) and insulin-like growth factor 1 (IGF-1) receptors can be found in several areas of the brain. GH receptors are mainly found in the choroid plexus, thalamus, hypothalamus, pituitary, putamen, and hippocampus, whereas IGF-1 receptors are mainly concentrated in the hippocampus and parahippocampal areas. In early life, GH and IGF-1 have an important role in the development and differentiation of the central nervous system. In the more developed central nervous system, GH and IGF-1 are thought to have a variety of functions such as a neuroprotective function, an appetite increasing function, various cognitive functions, and perhaps a blood flow-regulating function. In GH-deficient children and adults, improvement of cognitive functions was observed after the administration of GH. 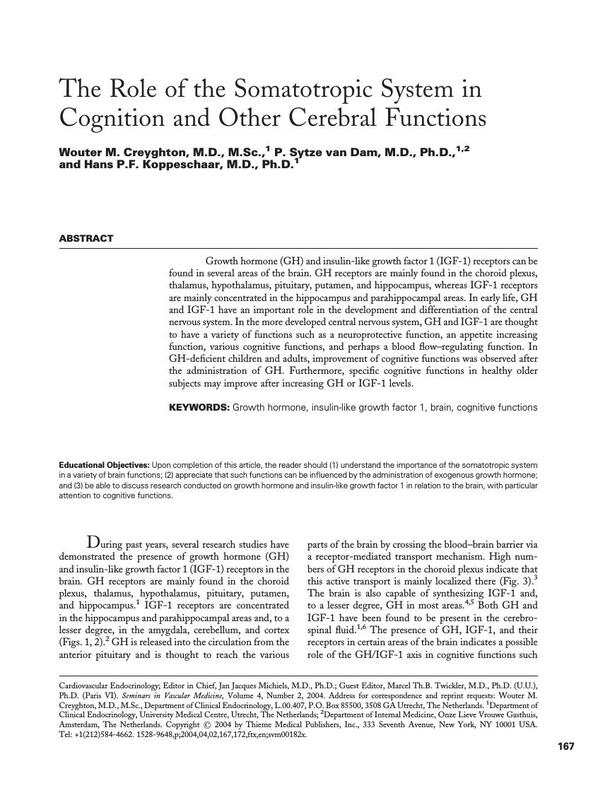 Furthermore, specific cognitive functions in healthy older subjects may improve after increasing GH or IGF-1 levels.